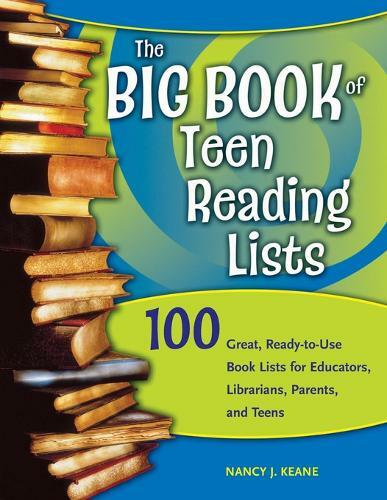 Use these 100 handy reproducible book lists to instantly create handouts for teen readers and teachers, add to your newsletter, or post on your web site or bulletin board. Based on the most common needs of educators and librarians who work with teen readers, these lists focus on new titles and classics that are still in print and readily available for purchase. Fiction and nonfiction titles for ages 13-18 are covered. Bibliographic information and a brief description are given for each title. A dozen bookmarks are also included. This is a great time-saving tool and a good source for finding extended reading lists and read-alikes! Looking for humorous novels for teen readers? A fast-paced sports novel for a reluctant reader? Biographies to use in history class? You'll find these lists and more in this treasury of great reading lists. This versatile guide provides one-page reproducible book lists and bookmarks for: books about self (e.g., coming-of-age, perfectionism, gangs; genre literature (e.g., fantasy, romance, historical fiction); themes (e.g., extreme sports, vampires, peace; settings (e.g., Ellis Island, Dust Bowl, WWII); character studies (e.g., adventure with female protagonist, boy bonding books, fantasy heroes); and read-alikes (for bookmarks). More than 100 reproducible lists of books for ages 13-18 (junior/senior high) focus on new titles and classics that are still in print and readily available for purchase. Bibliographic information and a brief description are given for each title.